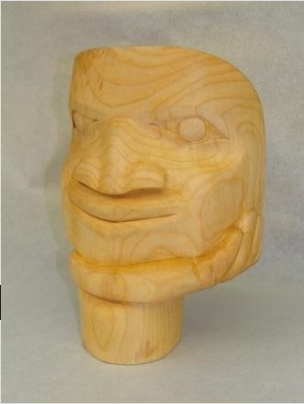 A couple of months ago, Haisla artist John Wilson told me about a promising first year student at the Freda Diesing School named Colin Morrison. After seeing some minor pieces by him, I commissioned a painting. It turned out to be his first professional sale. I am absolutely confident that it won’t be his last – and not just because I would like to boast ten years from now that I had the foresight to see his potential before he became well-known. “The Spirit of the Wolf” is an accomplished piece that illustrates Morrison’s potential better than anything I can say. It is all the more remarkable because it comes from a man in his mid-twenties. 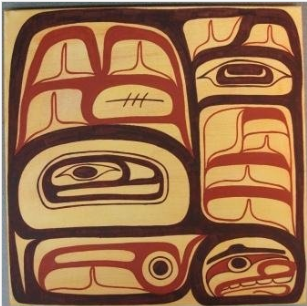 On the surface, “The Spirit of the Wolf” is a traditional piece, reminiscent of Roy Henry Vickers’ work. It shows a strong interest in style, with a variety of ovoids and U-shapes used throughout and a variety of tactics used to control the thickness and joints of the formlines. The sheer number of tactics could easily result in a mishmash, but Morrison controls it by having shapes mirror and contrast each other in disciplined way. The mirroring is especially obvious when the primary and secondary formlines are adjacent to one another. At the same time, you do not have to look very long before you realize that “The Spirit of the Wolf” has a playfulness that suggests a very contemporary outlook as well. The design is basically a play on the various interpretations of the title, with wolves spread throughout the design – everything from the physical wolf to the Wolf as a clan crest. This dichotomy is suggested by the vaguely yin-yang shape of the overall design. There is even, Morrison says, several spirits in the metallic paint of the design. So far, I have to admit, I have been unable to detect what kind of spirits they might be, or if anything specific is intended, but I find the idea immensely appealing all the same. 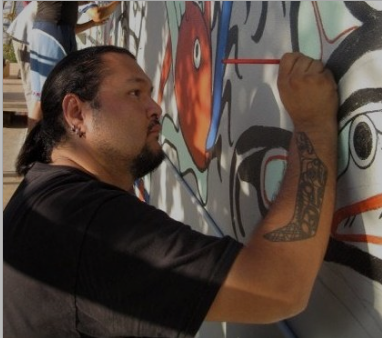 You could even go one step further and say that, since Morrison himself is a member of the Tsimshian Wolf Clan, that the painting itself is a manifestation of a wolf’s spirit. You might call the painting a kind of Northwest Coast “Where’s Waldo?” If you wanted to say the same thing more seriously, you could say that the content is as inventive as the style. Asked to say something about himself, Morrison replied, “I’m Tsimshian, Ginadoiks tribe, Wolf Clan. I’ve been an artist since I was young; I started painting when I was 18, and didn’t take it seriously till I was 23 years old. I’ve been painting off and on since that time, trying to figure out what I was going to do with my life. 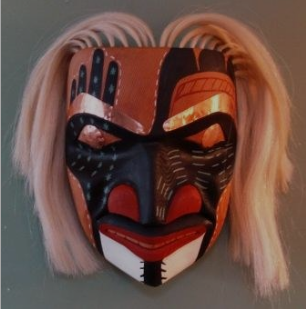 Since doing “The Spirit of the Wolf,” Morrison has completed his first mask and is in the process of finishing his second. 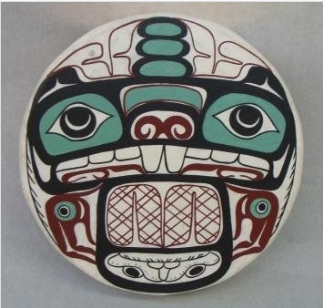 I expect that the world of Northwest Coast art will be hearing more from him, but remember (I said, with a certain pride) – you heard of him first from me. Every Christmas, after the turkey and stuffing and yams and mashed potatoes and trifle, the other members of my surviving family settle down for a nap. While they are snoring, I go for a walk or a run. By then, the restlessness that comes when I don’t exercise is stealing over me. Besides, I don’t get to my native West Vancouver very often, so the exercise is a chance to see what has changed in the neighborhood where I grew up. Superficially, very little has changed over the years. True, the distances seem shorter than I remember, and the streets seem slightly shabbier, no doubt thanks to the small size of contemporary budgets for infrastructure. But the traffic is as light as ever and the trees as many, and overall, the reality syncs with my memory of a quiet suburb of moderate privilege. The main difference is in the houses. Real estate prices being what they are, the middle class bungalows that I remember from my teen years are being steadily replaced by monster houses built as high and as close to the edges of the lots as the bylaws allow. Also, places that once seemed not worth building on are now subdivisions – never mind that they are so close to creeks that the basements are rumored to have their own pumping system. No doubt owners call these changes maximizing their investment, but to me these monster houses always seem a decline in aesthetics, especially when they pop up in unlikely places. Every year since I moved away from my parents’ house, I half-hope that I’ll see someone I knew at school. The possibility isn’t completely unlikely; a surprising number of classmates never left the municipality, and others, like me, have family ties that might take them back on Christmas Day. But I never have seen anyone I know, not once in all these years, although I peer hopefully at everyone I see walking or jogging, and often pass by the track at my old high school, where some of the people with whom I used to run might be expected. Instead, as I pass by familiar scenes, I remember. That house used to belong to a fellow athlete who, the last I heard, had been living where he grew up to take care of his mother. She’s supposed to be dead now, but I wonder if he is still living there. I heard Eighties rock from the sidewalk and wonder if he is spending Christmas alone, but somehow I don’t have the courage or the inclination to knock. I look up at the house where a girl I once knew grew up. We never dated – we just exchanged sympathies on the miserable states of our separate (mostly theoretical) love lives – but I wouldn’t mind seeing her again. Too bad her family moved away years ago. I pass the house where four of us used to gather for blackjack and board games when I was in grade eleven. I wonder if my former friend still has family there, but I see a basketball hoop and a hockey net, signs of teenagers, and judge it unlikely. Cutting through a park, I glance on the bridge on the house where a boy I thought obnoxious once lived. Then I remember that at the reunion three years ago the boy had grown into an equally obnoxious man, and increase my pace, as if thinking about him might make him reappear. Now heading home, I consider passing by the house where a girl lived who was once the object of my unrequited crush. But I tell myself that would be indulgent, to say nothing of several blocks out of my way, so I continue on my planned path. Nearing my old elementary school, I look up at the house where yet another crush lived. After the last reunion, we emailed each other a few times, but we haven’t had any contact in months, and aren’t likely to in the future. A few houses further on, another crush used to live. At the reunion, she had seemed prematurely aged and bitter, and somehow I hadn’t had the heart to talk to her. I wonder what her story is, and part of me is glad to realize that I’ll probably never know. By now, the sunset is near, and what little heat remains is being leeched with the light from the air. I ask myself what I am doing, growing melancholy over people who probably haven’t thought of me in years. I am no better, I tell myself, than the ex-friend who phoned us on Christmas Eve, full of news of other ex-friends in whom I have only a passing interest. If anything, I am worse, because I have no reason to suddenly feel lonesome. I hurry through the school grounds and back to my parents’ house, my exercise in sustained nostalgia over for another year, and no more successful than it has been in the past. Last Friday, the Queen Charlotte Islands in British Columbia were officially renamed Haida Gwaii, the name preferred by the First Nations people who live there. I suppose I should have a twinge of uneasiness about the fact that part of the geography I learned so painfully in elementary school has disappeared into the recycle bin with Czechoslovakia and Yugoslavia, but my main feeling is that the change was long overdue. In fact, in the last couple of decades, I’ve hardly heard anyone refer to the Queen Charlotte Islands. The only exceptions I can recall are The Globe and Mail, which I often think of a newspaper written by seventy-year-olds for seventy-years-old (and as too Eastern to know better), and members of the Monarchist League, who blindly defend anything with the remotest connection to royalty. The people who live on the islands call them Haida Gwaii, and that is enough for most people, either because they’re polite or out a vague sense that the people who live there should have a right to determine the name. I mean, it’s not as though one person in ten knows who Queen Charlotte was. I know, but, then I read history. Yet although in theory I have a good deal of sympathy for Queen Charlotte, who had to endure George III’s madness, in which he sometimes yearned for a woman other than her, in practice she doesn’t have much to do with British Columbia. Her sole association is that a ship on George Dixon’s voyage of discovery in 1786 was named for her. She probably would have hard-pressed to locate the islands without help. At any rate, the 18th century explorers of the Pacific, Cook and Vancouver included, may have been fine surveyors, but I don’t see why we should regard their poverty of imagination as unchangeable. When they came to naming landmarks, their resources were painfully limited: First, their officers, then their ships, then all the members of the English royal family they could remember, then start all over again. If you read about their voyages of discovery, you soon sense an air of desperation about their names. Sometimes, I’m surprised that we don’t have coast lines full of No Name Bays, Capes #42, and Mounts Whatyoumacallit. By contrast to the arbitrary names of the European explorers, Haida Gwaii is deeply meaningful to those who live there. Translated as something like “Islands of the People,” the new name acknowledges the people who have lived there for a minimum of ten thousand years, developed and still practice some of the most genuinely moving art that I have seen, and who are now moving rapidly towards self-determination. All this seem far more worth acknowledging in a name than a half-forgotten royal consort. Besides, if anyone wants to remember Charlotte of Mecklenburg-Strelitz, the islands still include a Queen Charlotte City. But when you think of it, the name change isn’t really radical at all. It’s just a recognition of how things are – and have been for some time. Last year, when I attended the Freda Diesing School Student Art Exhibition in Terrace, I noticed that most of the awards were for students 25 years old or younger. The school has some fine younger artists, but I thought that the older students deserved some recognition, too. To fill the gap, Trish and I decided to sponsor a Mature Student Award of $1000 per year, and to work towards making the award self-funding. enrollment in the second semester of the certificate or diploma program. students in the school both inside and outside class. The award will be given for the first time in January 2010. I have two main reasons for starting the award. First, as a late bloomer in my own craft of writing, I sympathize with the mature students. Being a student is hard enough when you are twenty, but when you are thirty-five or fifty, returning to school is even harder, because you probably have a family, and you are more set in your ways. Often, it means giving up a steady income when you’ve been used to one for years. At the same time, I know from years as a university English instructor that older students are worth encouraging. They add a maturity to the discussion, and often serve as role-models and mentors to younger students. 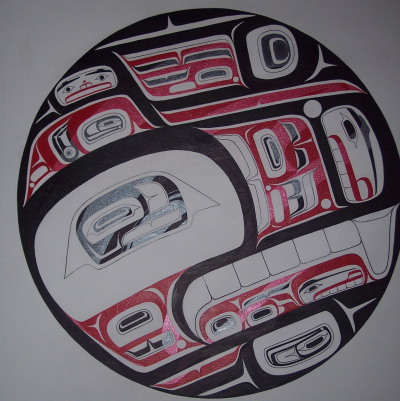 Second, I am a buyer and lover of northwest coast art, especially art in the northern style taught at the school. I am not one of those people descended from Europeans who feel personally responsible for the wrongs against the First Nations that began before I was born, but I do believe in paying my debts and in doing the little I can to alleviate current problems. 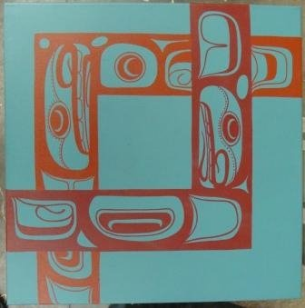 Northwest Coast art has given me hours of pleasure and learning, and I want to repay those hours with more than simple payment for each piece. I’d like to think that the award would help a student a little in the short term and in the long term maybe help them to launch their careers. Compared to the other awards that the school gives, the Mature Student Award is starting off slowly. But I hope that it will eventually match the other awards, and become self-perpetuating. If you are an artist, an art dealer, or someone who appreciates Northwest Coast art, please consider donating to the Mature Student Award. But don’t contact me. Instead, please contact Jill Girodat, the Associate Registrar at the Terrace campus of Northwest Community College at 250-638-5477 or jgirodat AT nwcc DOT bc DOT ca.